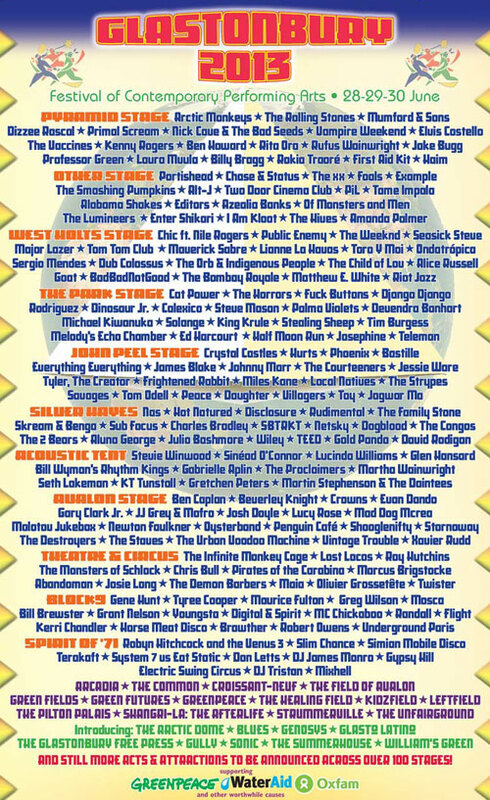 GLASTONBURY 2013 Lineup is here. WOW! | Do You Hear The Music? GLASTONBURY 2013 Lineup is here. WOW! My jaw is still on the floor scouring this lineup and seeing the insane amount of talent performing at Glastonbury this June 28-30. I mean just read through this thing a bunch of times. Sure The Rolling Stones, Mumford & Sons, Arctic Monkeys, Dizzee Rascal, Primal Scream, Nick Cave & The Bad Seeds, Vampire Weekend, Elvis Costello, The Vaccines, Kenny Rogers, Ben Howard, Rita Ora, Rufus Wainwright, Jake Bugg, Haim, First Aid Kit all on the Pyramid Stage is enough to get most anyone to buy a ticket but just look at the Other Stage and the John Peel Stage.